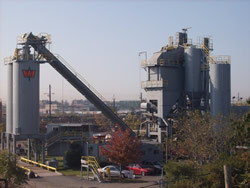 Weldon Asphalt has been a major producer of hot mix asphalt in the Northern and Central New Jersey market since 1946. Weldon Asphalt has supplied contractors with HMA for driveways, parking lots, interstate highways, and airport runways. Weldon Asphalt plants include two drum-mix facilities and seven batch type plants with the capacity to handle 20,000 tons of any specified material per day. Our technical service staff works closely with the marketing and operations people to supply the highest quality mixes for a driveway or the latest super-pave project. As an industry leader, we were first to install state-of-the-art controls, storage silos, and drum plant facilities in New Jersey. We are also a leader in the recycling community, allowing us to contribute to the “Green” aspect of road construction. Weldon Asphalt is a total supply house with no laydown or contracting company in competition with its customers. We are committed to providing the hot mix contractor with the best service, product, and competitive pricing to compete in both private and public markets.